BELLEVILLE, New Jersey (WABC) -- Police in New Jersey have arrested a man they say tried to drag a woman out of her room during a violent home invasion. The incident happened just before 4 a.m. last Friday, when police say 25-year-old Jermaine Ramirez entered through the side door of the home on Eugene Place in Belleville. A woman inside was sleeping in the basement with her two children, ages 3 and 6, when she said she felt a presence in the room and woke up to find the suspect. He reportedly covered the victim's mouth and tried to drag her into another room, but one of the children woke up and ran upstairs to tell the grandfather. The suspect took $20 from victim's purse and fled out a laundry room window. He is believed to have been in the house for at least 40 minutes before waking up the homeowner. 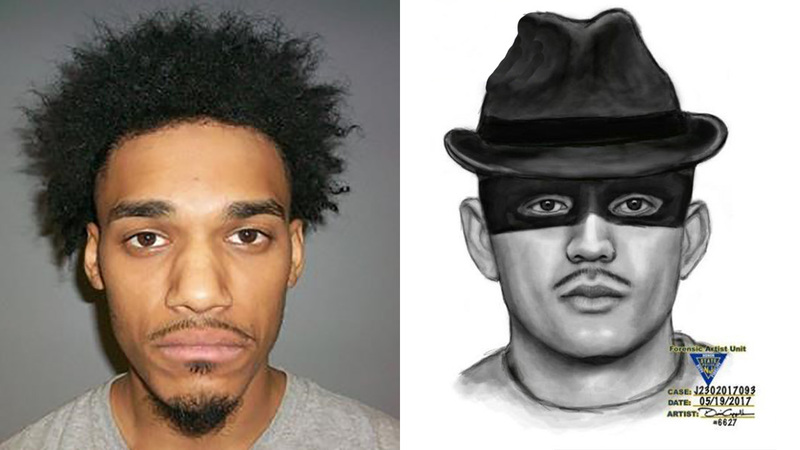 A sketch showing the suspect wearing a fedora-style hat and a thin mask over his eyes helped detectives identify Ramirez, whom they are familiar with from previous incidents that occurred in September 2016 in Belleville and Bloomfield. They canvassed that area around his current residence for surveillance video and located footage of Ramirez walking out of his home at approximately 3 a.m. that night wearing similar clothing to what the witness described. A search warrant located that clothing, and Ramirez was brought to the police station. He reportedly admitted to committing the burglary and theft, and charges are pending.